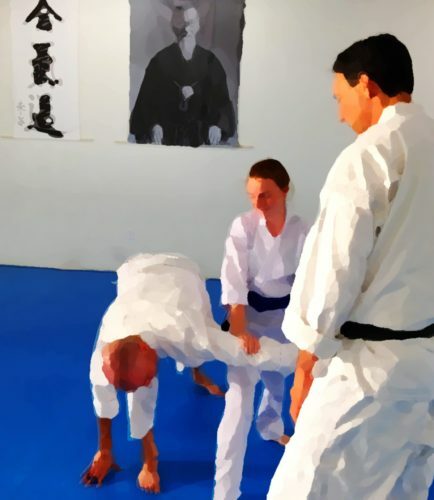 This is a guest post, by Michael Hancock, one our instructors at Aikido of San Diego. Originally from England, he teaches, and leads meditations, with a lovely Brit-dialect, respect for tradition, thoughtful insight, and a gentle sense of humor. Michael is an avid golfer, pilot, and horseman, and when living in England was an accomplished polo player, having once been Chairman of the oldest club in the world, Silver Leys. He is an entrepreneur whose focus is on his family and community. Among other things, Michael is active in promoting and advising the Wampler Foundation, providing camp and outdoor education programs for kids with physical disabilities. Enjoy. Because my Google search gave me little since he received an honor from the Japanese Ambassador on behalf of the Emperor in London several years back, I wrongly assumed he had since passed on. I’m back in England, and last night, by chance or providence, I’m nearby the dojo of ‘Master Pat’ Stratford, my first mentor. It was 7.25 pm for the 7.30 start and the door was still locked. He looked old to me 25 years ago, but I was still surprised to see a pensioner struggling to climb out of someone’s car and stagger across on crutches at 7.29 on the dot. Yes, same face and instantly recognizable except for a few more good vintages behind him. For a fleeting moment I wondered if this was a good idea, but I reintroduced myself anyway and he cheerfully engaged. We chatted about old times and old members for a short while. We sat for a few minutes to one side. I declined his offer of tea that I’m sure had an aromatic whiff of medicated navy rum as he drew on his pipe. He informed me that there are now eight aikido clubs in the Coventry area alone, but added that they are losing their way. He believes they are generically too mindful of ego and money. A couple of the old boys are still around, reminding me of the clichéd movies of boxers or ball players of a bygone age, still with the enthusiasm of teenagers and a wickedly dry wit that bantered between them. The warmth of camaraderie made me feel right at home again. 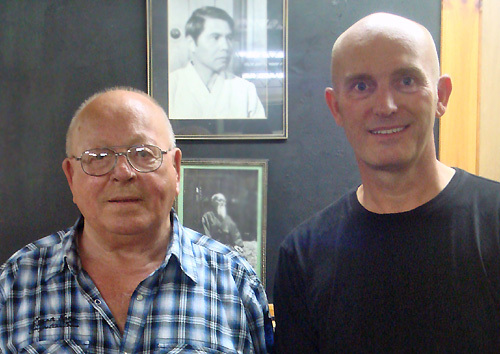 He shared with me his thoughts on Japan and said there is a lot of “crap Aikido” because the culture has changed so much as a result of the Americanization of the country after the war, and that most are now chasing the dollar and missing the fundamentals. I sensed an air of nostalgia or sadness when he added that no one turns up here anymore. Master Pat has an endearingly maverick character that is so likeable. He’s the real deal. You cannot question his dedication, yet I think he inevitably divides opinion. In fact, he is worried for the state of the world in general and was satisfied to be his age. He added that a couple of the other dojo owners still come back once a month or so and are very welcome. Years ago he would teach all over Europe, however, he still leads monthly Aikido events, albeit these days hosting at his home dojo as traveling is difficult. I declined his invitation to train and told him I’m sporting an injury. He ordered me through his wry smile, “Don’t be a soft nancy boy and get on the bloody mat, you’ve been in bloody America too long!” Ah yes, I remember him clearly now, and started to stretch. Six turned up last night and I made the seventh. I am somewhat ashamed for playing my part in not returning for 25 years, and to say that in my opinion, he is an under-valued magician, a somewhat forgotten Master that by all that is right, he deserves to have a huge entourage of followers surrounding him and absorbing this beautiful art while they can, not a mere half dozen. Inevitably, he won’t be here for long. I learnt something about myself last night and will consciously embody some of his thoughts and his portrayal of ‘feel’ in my own personal training hereon. In fact, I wish I could get back here again soon, but living six thousand miles away in San Diego creates its own difficulties. Thank you, Master Pat, you are one of a kind and still remain an inspiration to me.